When Bella, and Alice saved Edward, they had to talk with the Volturi. But what if they had to become one of them? They never had a choice, and Bella has a lover from the volturi, but how will Edward cope? What about Alice? Can they live their new life? A few months ago I had written this story, but I've rewritten it. Zoey sets out to find Edward and Jacob. more than just people but emotions that her Gram once had. I make my own banner :D I can make one for you too. Heaven just moved to Eatonville Washington. Another move due to her "problems". She is dying inside as her parents distance themselves from there "freak" daughter. She doesn't know why she is freak, or how she ended up the way she is. Edward is bruised and broken after Bella chose a life with Jacob over him. Can Heaven let the Cullen's know her secret? Will Edward drop his walls and let this sweet stranger into his life? Will she ever find somewhere that she truly belongs? Edward tells Bella: "When we hunt, we give ourselves over to our senses." What does Jasper feel when he hunts? Bella talks to him about his feelings on a hunt. Occurs between New Moon and Eclipse. THIS IS THE SEQUEL TO " A NEW BEGINNING" AND I WROTE ALOT SO READ!!!!!!!!!!!!!!!!!!!!!!!!! BTW-my people who won the contest are posted and will appear in my story as a new group of vampires AwesomeAlice94-Ashley Twilightaholic-Maddie MyBrandOfHeroin-Shannon Vintage-Addie emmet_cullen-Mikala menti belle-Fisher (middle name...has a very common first name) ENJOY! "Would you like to hear my story, Bella? It doesn't have a happy ending—but which of ours does? If we had happy endings, we'd all be under gravestones now." Based off this quote from Eclipse...or what happens after this speech/monologue. What if Jacob imprinted on Bella and Edward's leaving pulled them closer? What if Bella chose her Sun over the Eclipse? Why Bella? Why did you come to our home tonight? He told me to I trusted him. The Cullen boys go hunting. Jasper can't stop quoting The Princess Bride, Emmett can't stop quoting Monty Python and the Holy Grail, and Edward, rather put out, responds with Shakespeare. Hilarity ensues! Co-written with the awesome Blondie AKA Robin. What are Bella and Edward going to do for there first christmas together? Check AN on chapter two! It's Bella's fisrt christmas with Edward and she thought they would spend it together. But Charlie is making her go down to La Push to spend it with the Blacks. Will her knight in shining armor come through and save her? Will there first Christmas together be a sucsess? and what changes will be made to there relationship? A story set a year after Bella is turned into a vampire. "The haunting, metallic smell fills her nose. She shrieks and turns in the dark room, searching for the source. Her hands are sore from the chains that bind her. But they will not bleed, no matter how hard she tries she can not bring forth a single drop to drink." Bella has difficulties dealing with becoming a vampire. She will do anything for blood, and Edward wishes that he could please her. This takes place after New Moon. Edward attempts to surprise Bella with something big. But there plans are interrupted with others that have plans of there own for Bella, and the people she loves. Final Chapter Added! 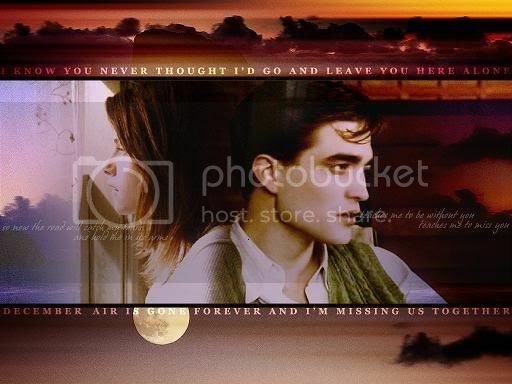 Bella decides she's too afraid that Edward's going to leave her again and leaves him for.... Jake! Big, and i mean big humongous, the size of a werewolf twist towards end with a promise of a sequel! Rated Adult b/c some of the scenes might end up being adult-themed! Two strangers come to Forks, Washington to investigate rumors about vampires and werewolves. What they discover changes everything ... for them, and the people they meet. But is there really such a thing as "happily ever after" when death is involved? Edward and Jacob : Partners in Love. When Edward is caught speeding by one of those hidden radar guns, his license is taken away! Whatever will he do? Emmett annoys Edward. Because, thats what siblings do, right. Or maybe because, It has something to do wit the 60 inch plasma Edward crashed in New Moon! Emmett misses his TV! (remeber Edward crashed something after the vote in new moon. Stephanie said it was a Tv.) This is POST-New moon a couple of days after the events that happened in New Moon. Please Review. I don't know if its funny or not. You decide. Please Read and review. Edward never came back after that day in the forest. Few weeks after Bella realizes she's pregnant, she moves out of her father's house, and meets a family of vampires. After 100 years later she meets a familiar face again. This is one of my old stories, but im fixing it, trying to make it better. Please read and telll me what you think. It takes place after New moon. Bella is pregnant. Edward wasn't so guarded with Bella, but he still leaves and later Bella finds out she is pregnant. How will her life fold out? This is a sequel to Everlasting Love. It is about Ava and Bella's transformation. CHAPTER 5 IS UP!!!!!! When Edward left Bella, he left her broken. She never thought she could ever pick herself back up again, until she realized she didn't have to. Jacob was there to heal her wounds, and he made her a different person, a person that could fall in love with and marry a werewolf. And that she did.